THE LABOUR PARTY has been accused of seeking to avoid “electoral meltdown” after Tánaiste Eamon Gilmore said that water charges would not be introduced at the beginning of next year. The junior coalition partner has also been accused of “political posturing” as the two main opposition parties criticised the government’s approach to the imposition of water metering and charges as it has committed to eventually doing under the EU/IMF bailout programme. The comments came after Gilmore insisted that charges would not be introduced next January as a metering system to measure water usage at each property in the country would not be in place. This appeared to contradict comments from Cabinet colleague Phil Hogan last week which has led to Fianna Fáil’s environment spokesperson Barry Cowen accusing the government of “making it up as it goes along”. Cowen said: “Just days after the Minister responsible for water charges Phil Hogan confirmed that charges will be introduced on January 1st 2014, the Labour Party Leader has now attempted to overrule him. He suggested that Gilmore’s comments, in the wake of questions about his leadership of Labour, raised the “suspicion that this announcement has more to do with Labour Party politics than anything else”. This issue was also raised by Sinn Féin’s environment spokesperson, Brian Stanley, who said that the introduction of water charges at the beginning of next year and ahead of the local and European elections “would ensure melt down” for Labour. “Fine Gael and Labour need to be honest about the real cost of water charges. 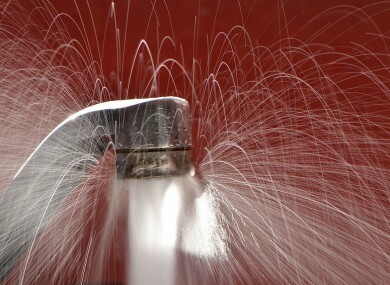 Some €1.1 billion is spent annually on water services in the state, which is over €600 per household,” Stanley claimed. He added that Sinn Féin will “actively oppose” water charges. Cowen said that Fianna Fáil believed that before any charges should be introduced there needed to be guarantees about quality, reliability and efficiency of service. Meanwhile, the Fianna Fáil group in Dublin City Council will this evening propose an emergency motion which will oppose the introduction of water charges in advance of a reliable water supply. It comes in the wake of restrictions imposed on the city’s water supply for homeowners and business throughout much of last week due to the unseasonally cold weather. Email “Opposition parties attack Labour for 'political posturing' over water charges ”. Feedback on “Opposition parties attack Labour for 'political posturing' over water charges ”.